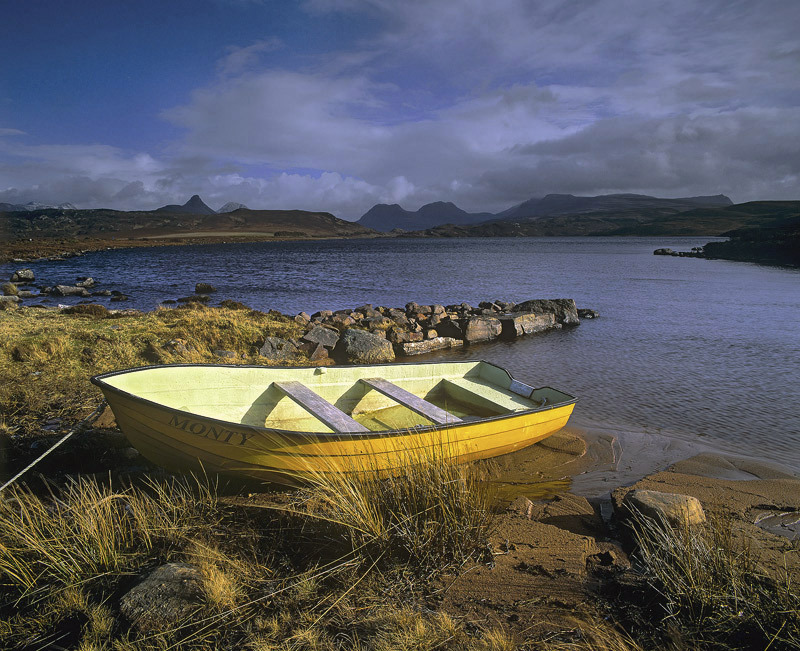 My delight at finding this bright yellow row boat hauled out on the shore of a wee loch in the Inverpolly Reserve was immeasurably amplified when I saw its name emblazoned on the prow. "Monty" was half full of rainwater after the recent passing deluge. With the sky still blackened and strong lighting breaking through to light up the boat just one thing came to mind, now what should I call it. you've added a few images since I last visited this gallery I see. I like this one the best, gorgeous lighting on that boat. perfect mix of cold and warm colours, you capture the light in the subject at the right time! love it. Fabulous picture, wonderful colors and light. V.
Fntastic image, great colors v.
Beautiful and colorful - like it a lot. What a great find :o) and the yellow boat goes so beautifully with the light and the stormy background.